Managing the waistline: Choose bottoms that have adjustable waists. Most brands now offer this - it's simply an elastic band with buttonholes in the waist for sizing as required. When adjustable waist bottoms are not available, choose bottoms with belt loops so that Dapper Snappers or similar hold-up-the-pants gadgets can be used. Choose footless PJs over footed. The girls definitely get more wear out of footless PJs as they can wear them till the PJs are too snug around the waist. Choose dresses that are designed to fall below the knee. When buying online, some websites will actually specify this - Osh Kosh used to, but as I was writing this post, I couldn't find any example to use. Guess they took it off their website - shame! Jeans: Choose skinny and straight cuts over bootcut. Shop across the aisle: Boys clothes of the same size are typically cut longer than girls. It's worth it to take a look and buy some of the unisex pants from the boy section. 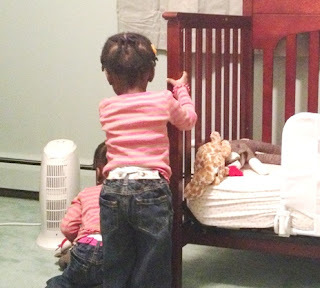 Case in point, I got all the lined pants the girls wore this winter from the boy section of Gymboree. While all their other 2T pants are now short, these pants still fit them lengthwise. Thats my list of 10 tips for dressing the slim toddler. I could add an 11th tip that said "Learn to sew" but that's so not happening, I stopped dreaming. Last year I went on a bodysuit shopping spree to evaluate the different brands of baby clothes and the results were interesting. I did the same thing with size 18-24 clothes that the twins just recently outgrew. I bought different brand name clothes for a size and quality experiment. Why? Because for the first one year, baby cloth sizes change every 3 months on average. For the second year, the sizes change every 6 months. From age 2 up, kids' clothes are sized by year. If the clothes now need to be worn for a year, I need to make the best decision as to which brands work for us - I'm a fairly brand loyal customer when it comes to clothes. Baby Gap / Gap Kids is a clear winner for us with best fit at decent prices. Bonus points for having a store in every major Calgary mall and a factory outlet close by. 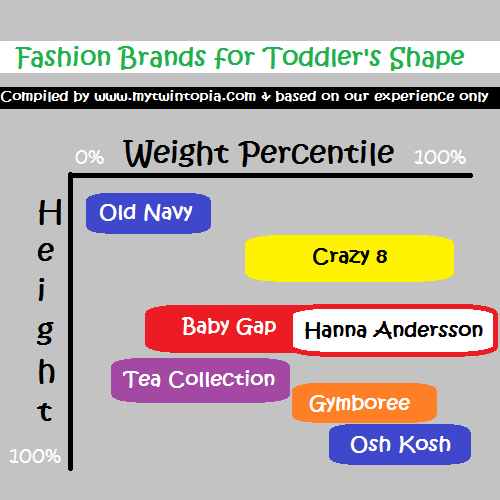 Note on Hanna Andersson: Their clothes are sized by kids height and not age. That does it on my children's clothing brand experiments until I can come up with new reasons to shop. So, whaddya think? Any brands you think I should look into? My babies turned 2 and a quarter years old in February and as usual, they leave me speechless just looking at the depth, richness and diversity of their personalities. Here's a short post celebrating their quarter birthday! Is the coolest little girl I've ever met. Is the goofiest little girl I've ever met. The girls are now fully potty trained both at home and in the daycare. The use of diapers is restricted to naptimes only. Accidents are very few and far between. I'm currently trying to get them to fully ditch the pottys and use the toilet with a soft seat installed on top. BEST BUY TIP: The soft seats that have handles are great as they give the girls something to hold on to when they feel like they're going to fall in the bowl. I've seen them sold under the First Years and Ginsey brands in both US and Canadian Walmart, Superstore and Amazon. For hotel use, I packed the Folding Travel Potty Seat I got with my Huggies rewards points. It's a pretty decent solution. Tip: If you feel a bit queasy about this being in contact with the rest of the stuff in the suitcase, keep it in a ziploc bag. Our first use of a public restroom was unplanned. On a whim, Dad and I decided to go hangout in the mall with the kids after work. They rode on the carousel, ate a hearty meal, drank some milk and then uttered the 3 words that made my germophobe-heart sink to my diaper area: "peepee potty mama!". Luckily, the mall had a family room but still I found the whole experience severely traumatic. I have since stocked up on disposable toilet seat covers which I keep in my handbag and in the car for any future excursions to a public restroom. You know how the experts say having your kids watch you use the restroom is one of the ways to get them comfortable with potty training? Well I've been doing that and nowadays, when I'm done, the girls tell me "Good job Mommy! Now flush! High Five!". A sweet reward for loss of privacy and dignity won't you say?! Have a great weekend peeps. It's going to be 20degC in Calgary! Can I get a WOOT! Well hello! It's been 90 long days and longer nights followed by 10 hours of exam writing. I'm worn out, hopeful, rejuvenated and super excited about summer (for the first time ever). AND I'm back to blogging. When I decided to take a break, I wasn't sure I would actually resume blogging. Life with 2 toddlers is busy. Throw in working 40+ hours a week and doing home stuff and I just wasn't sure there was room in my life for blogging. There isn't! All the more reason why I shouldn't stop blogging. I need this outlet. What I won't be sharing with you? Crafts! 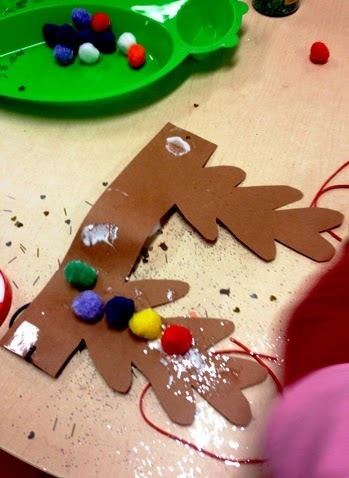 The exhibit below - our attempt at making and decorating a reindeer hat - is proof that I have a lot of callings, crafting's not one of them.